Badgers are short-legged omnivores in the family Mustelidae, which also includes the otters, polecats, weasels, and wolverines. The 11 species of badgers are grouped in three subfamilies: Melinae (Eurasian badgers), Mellivorinae (the honey badger or ratel), and Taxideinae (the American badger). The Asiatic stink badgers of the genus Mydaus were formerly included within Melinae (and thus Mustelidae), but recent genetic evidence indicates these are actually members of the skunk family, placing them in the taxonomic family Mephitidae. The European badger is one of the largest; the American badger, the hog badger, and the honey badger are generally a little smaller and lighter. The stink badgers are smaller still, and the ferret badgers are the smallest of all. They weigh around 9–11 kg (20–24 lb), with some Eurasian badgers weighing around 18 kg (40 lb). The behavior of badgers differs by family, but all shelter underground, living in burrows called setts, which may be very extensive. Some are solitary, moving from home to home, while others are known to form clans called cetes. Cete size is variable from two to fifteen. Badgers can run or gallop at 25–30 km/h (16–19 mph) for short periods of time. Badgers are nocturnal. In North America, coyotes sometimes eat badgers and vice versa, but the majority of their interactions seem to be mutual or neutral. American badgers and coyotes have been seen hunting together in a cooperative fashion. The diet of the Eurasian badger consists largely of earthworms (especially Lumbricus terrestris), insects, grubs, and the eggs and young of ground-nesting birds. They also eat small mammals, amphibians, reptiles and birds, as well as roots and fruit. In Britain, they are the main predator of hedgehogs, which have demonstrably lower populations in areas where badgers are numerous, so that hedgehog rescue societies do not release hedgehogs into known badger territories. In some areas they are known to prey on lambs, and may bite a ewe defending her lamb, almost always leading to infection of the bite. They are occasional predators of domestic chickens, and are able to break into enclosures that a fox cannot. 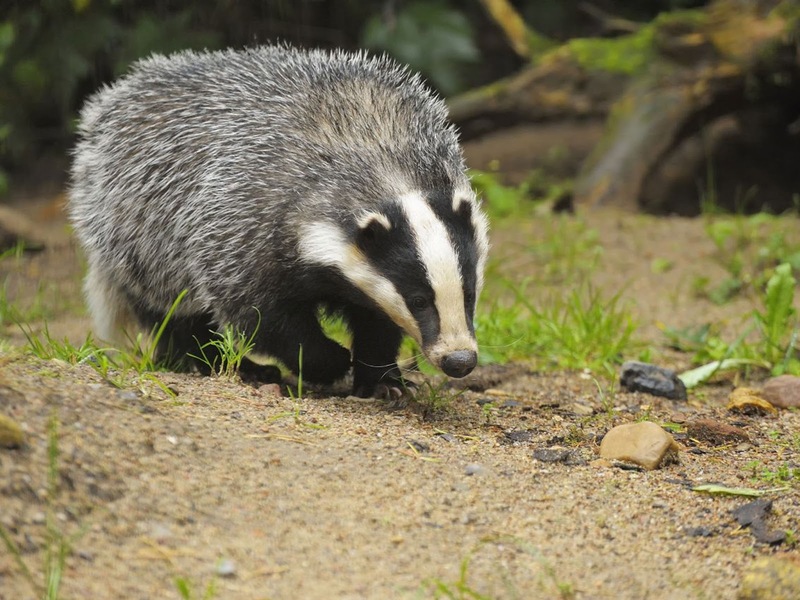 In southern Spain, badgers feed to a significant degree on rabbits. The honey badger of Africa consumes honey, porcupines, and even venomous snakes (such as the puff adder); they climb trees to gain access to honey from bees' nests. Badgers have been known to become intoxicated with alcohol after eating rotting fruit.